Persia, the current Iran, this is where we are bound. In a neighbouring village of Yspahan, once the Persian capital, we are salesmen who hope to make a profit during an all-time high in the medieval Persian economy. 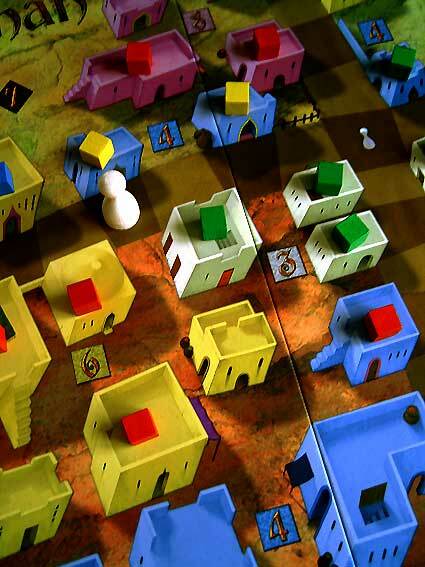 The central city board of the game shows four neighbourhoods, each consisting of groups of shops, called souks. Besides the major board there are two additional, smaller, game boards: a dice board disguised as a Persian tower, and a caravan board, used to send goods on camelback to Yspahan. Each player gets his own individual board with prefab buildings that can be activated during the game (paying with money and camels), and 25 goods cubes in his own colour. A meagre two gold coins forms the starting capital of each player. 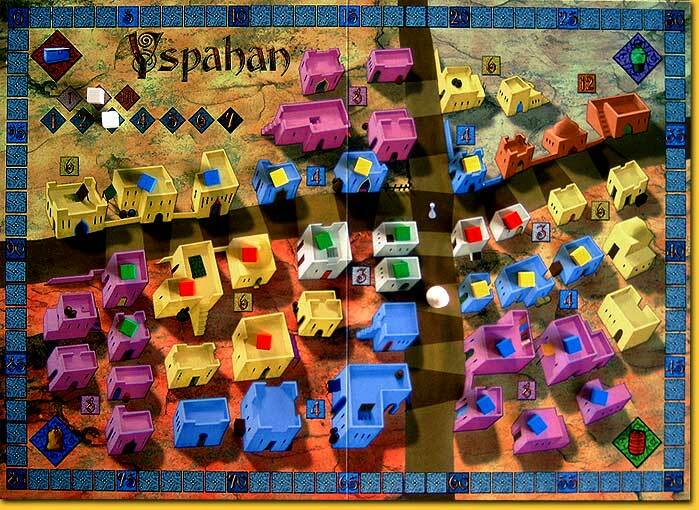 The goal of the game is to score as much points as possible; points that can either be obtained by supplying goods to the souks, or send them by caravan to Yspahan. At the end of 7 rounds (days) the souks and the caravan are scored. The games lasts three of these weeks, and no, there are no days to rest! A day in our Persian life goes as follows: the starting player throws nine dice which are then distributed over the six floors of the dice tower. Optionally, he can buy a maximum of three additional yellow dice for one gold coin each. These yellow dice can only be used by the starting player. Next, the dice are distributed from the lowest floor to the top: the group of dice with the lowest value go into the lowest floor of the tower, the group of dice with the next lowest value go into the next lowest floor, and so on. The exception is the group with the highest value: these dice go into the top-level floor of the dice tower. After the distribution the starting player chooses a store from the tower. The top-level store is the “gold floor”: the player gets as many gold coins as there are dice on this floor. The lowest floor is the “camel floor”: each dice means one camel. The intermediate floors are used to supply the shops (souks) in the different neighbourhoods with goods in the player’s colour. Each neighbourhood is marked with a symbol that corresponds with one of the floors. For each dice one good cube may be placed in a souk (shops in the same colour in a neighbourhood). If one of these options is not favoured by the player, he can always choose to either take an action card, or move the supervisor, who took his starting position on the intersection of the two streets of the city. The supervisor is moved a number of steps equal to the value of a group of dice. When the supervisor stops for a shop with supply, then these are immediately sent to the first free camel of the caravan. 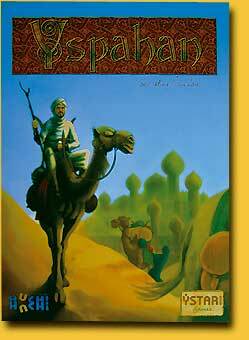 As compensation, the owner of the goods gets the points shown on the camel. By paying a camel, the goods don't have to be taken from the shop, but from the player’s own supply. 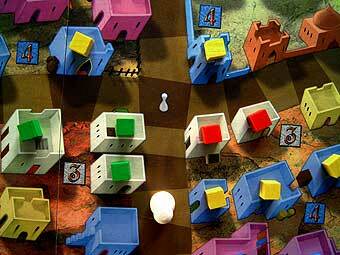 After the selection and execution of one of the dice actions, the player still has the option for a second action: building one of the six buildings on his own building game board. Once built, each building gives a nice advantage, such as additional gold coins or camels, or placement of an extra goods cube in a souk. Moreover, the buildings score points; 5 points for the third building, and the last one even 10 points, resulting in a possible maximum of 25 points for a completed building game board. x The turn now moves to the next player, who has the same possible actions. The dice chosen by the previous player(s) are removed, however, resulting in lesser and lesser options for floor (dice action) selection. When each player has made a choice a day comes to an end, and a new day breaks with a new starting player. After a week it is pay day: the souks score points as much points as indicated on the city board, but only if all shops of the souk are supplied. After this the caravan is scored: it consists of three rows with camels, and a player gets the number of his goods in the caravan, multiplied with the highest row, where he has goods on a camel. For example, when a player has two goods in the lowest row, this earns him 2x1 points; with an additional good in the next higher row and a new total of 3 goods, he may multiply this by 2. While all goods from all shops are removed at the end of the week, the goods in the caravan stay on the camels. Supplying souks, erecting buildings, watching the supervisor, while not neglecting the caravan, it can be busy days as a Persian salesman. And then there are still the action cards which can played at any time during a player’s turn. These cards are quite powerful and give advantages such as supplying an additional good to a shop, obtaining gold coins, or turning money into camels or vice versa. Action cards can be obtained a an alternative dice action, or  when the applicable building has been erected  after sending a good to the caravan. Yspahan plays fluently, gives a player tough choices to choose from, while also resources needs to be managed efficiently. Who seeks strong interaction, needs to look for another game. One can get nasty by sending another player’s good to the caravan, but each player has exactly a total of 21 actions in the game, making this kind of moves rather costly. One of the nicest things of the game is throwing a hand (or maybe two) of dice, hoping for either lots of 1's or 6's, as both gold and camels are equally important for erecting the necessary buildings, and being starting player gives one the first choice. There are several ways to victory in Yspahan. One can focus solely on supplying the souks with goods, or build as fast as possible. Using the supervisor to load the camels of the caravan requires some more experience, but this can be a rewarding option as well. 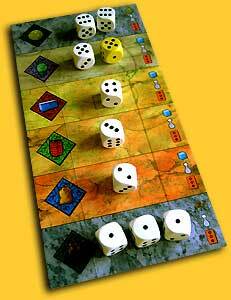 However, don’t expect to much in-depth tactics from this game; a bad dice throw can frustrate any planning made. The winner will therefore typically base his victory on his terrific perception of the game, while the others will moan and groan about their lack of luck with the dice. Players with a preference for deeper games will detest these kind of games, the occasional player will find unconcerned joy - both, however, will be able to implement some sort of tactics. In its short existence as a game publisher, Ystari has established quite a name, especially by publishing 'Caylus'; adored by many, abused by others. 'Yspahan' is much lighter, and as such a typical family game. Competition does not stop in the shops after having bought a game, at home, on a games night, the games on the shelves still compete on getting played. And then, after the first few exciting plays, it could as well be that the desert dust settles permanently... on the game box.